The company, Total Reclaim, also has been fined by regulators in Oregon and Washington, and in Washington it lost its biggest client — an organization operates the E-Cycle Washington program in conjunction with the state Department of Ecology. 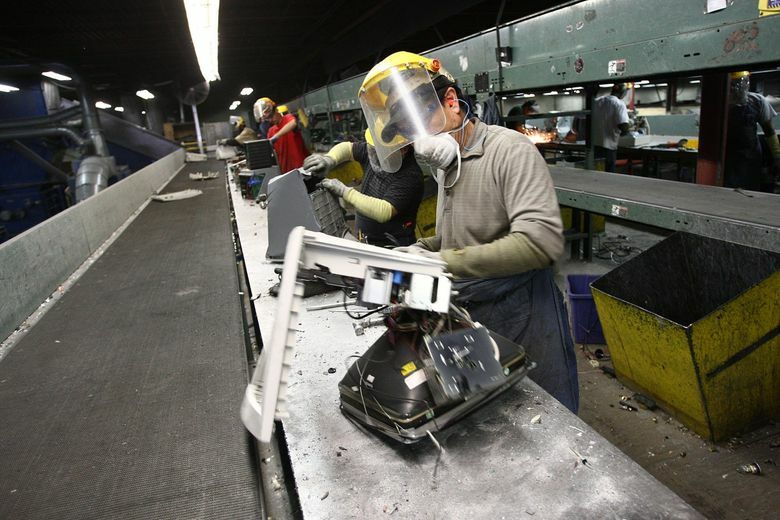 SEATTLE (AP) — The owners of a large Northwest electronics recycler are facing a federal conspiracy charge, after investigations found the company lied to customers by having mercury-containing flat-screen monitors shipped overseas instead of disposing of them safely in the U.S. Charging documents filed in Seattle on Wednesday say Total Reclaim Inc.’s customers paid at least $1.2 million to have the material recycled from 2008 to 2016. Instead, the company sold the monitors to another company, knowing it would ship them to China, where workers dismantled them without safety or environmental protections, authorities said. The practice was uncovered almost three years ago when an independent watchdog group placed trackers on some of the monitors. Total Reclaim has since been fined by regulators in Oregon and Washington, and in Washington it lost its biggest client — an organization financed by the electronics industry that operates the E-Cycle Washington program in conjunction with the state Department of Ecology. The U.S. attorney’s office in Seattle filed the conspiracy charge against Total Reclaim’s owners, Craig Lorch and Jeffrey Zirkle, in a document called an information. Such charges can be filed only against defendants who have waived their right to be indicted by a grand jury, and it typically means they have agreed to plead guilty. Lorch and Zirkle are scheduled to appear in U.S. District Court on Friday. Reached by phone Thursday, Lorch declined to say how they intended to plead, but he emailed a written statement noting that they have cooperated in all investigations. “The charges filed today by the Department of Justice relate to conduct by Total Reclaim’s owners that they previously and publicly acknowledged and for which they promptly apologized and took responsibility,” the statement said. Washington’s Ecology Department fined Total Reclaim $444,000 in 2016 and fined the company $67,500 last year after saying it discovered the company was still improperly storing thousands of flat-screens in trailers on Seattle’s Harbor Island. The company appealed the fines, but in a settlement with the department last week it agreed to pay nearly $84,000 to the state as well as $300,000 to the Western States Project, which enhances government enforcement of environmental laws in the American West, Ecology spokesman Andrew Wineke said Tuesday. Total Reclaim’s customers have included the city of Seattle and the University of Washington. It also operates in Alaska.